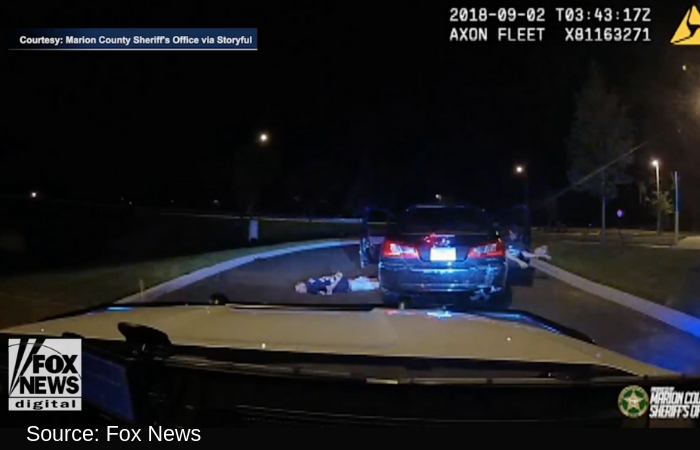 On Sunday, an incident occurred around the 3600 block of South Pine Avenue in Ocala when two Florida men led the Marion County Police on a chase in attempts to get away due to the large amounts of drugs, a loaded gun, and unlikely adorable friend.The offices of the county department released the body-cam and dash-cam footage on September 5th which shows the attempt to stop the two suspects. Police described the stop as a normal traffic stop but began to pursue the suspects when the black Mitsubishi failed to stop. They then tailed the vehicle for a couple blocks before the black vehicle turned east onto SE 31st Street entering into a parking lot located behind Ocala Fire Station Rescue 7. Before the Mitsubishi comes to a full stop it is seen in the video the passenger of the fleeing vehicle throwing out a large bag from his window which is later ceased and put into the investigation. Once the vehicle came to a stop, the two suspects who later were identified as 39-year-old David Lolley and 40-year-old Daniel Jones were instructed to exit the vehicle slowly with cops weapons drawn. First, the driver is seen exiting the car, as the video continues you can see Jones emerging from the vehicle with what is identified later as a female pitbull puppy. As the Police search the vehicle they made sure to keep the adorable puppy safe and calm, before making the call to Marion County Animal Control. The suspect will need to show documentation and proof that the animal is his if he wants to pick it up. During the search, police found enough methamphetamine along with cocaine, ecstasy, heroin, and marijuana to be considered trafficking amounts. The two suspects were also armed when the police located a loaded .32 caliber Kel-Tec firearm under the front passenger seat.One round was found in the chamber. The weapon had been reported lost, according to authorities. According to authorities, Jones the 40-year-old was charged with trafficking in methamphetamine, possession of cocaine, ecstasy, heroin, and marijuana, possession of a firearm by a convicted felon, possession of a firearm during the commission of a felony and possession of a concealed firearm. Lolley 39 – year-old was charged with the following: fleeing to elude, possession of drug paraphernalia and driving with a suspended or revoked driver’s license. Lolley also was found with several syringes located with heroin residue on his body. He claimed to be a diabetic. Hip Hop Artist Mac Miller Pronounced Dead in his L.A. Home, Apparent Drug Overdose.